A protected bike lane in Pittsburgh’s university district, 2014. There’s not much question that quality bike lanes make it much nicer to ride a bike. Seville could never have leapt from 0.6 percent to 7 percent of trips by bike in six years if not for its new 80-mile network of protected bike lanes. If Hangzhou hadn’t separated bike and motor traffic on 84 percent of its roads, there’s no way that 44 percent of its car owners would still be biking each week. Bike lanes are good. But are they overrated? That’s one of the useful questions asked in a report out last week from our friends at the League of American Bicyclists. Called “The New Movement,” the 66-page report documents dozens of community groups and individuals around the country working to support biking among people of color, immigrants, low-income riders and people with disabilities. Because we’re infrastructure specialists here on PeopleForBikes’ Green Lane Project team, one thread running through the report caught our eye: the notion that U.S. biking advocates, starved of good bike infrastructure for decades, have come to ascribe too much importance to it. Though no one in the report is objecting to making streets more comfortable, it’s clear that comfort is far from the only barrier to biking or the only factor needed for biking to have political support. 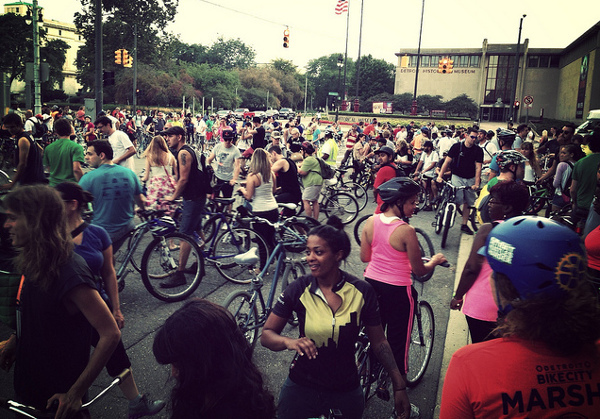 Preparations for a Slow Roll in Detroit, 2013. Photo: Russ. I think that one of the things that has to happen is the understanding that it’s not infrastructure first… There’s a perspective change that has to happen for some communities we’re working with, and transportation is not it. It may be health improvement. It may be safety on the streets. I don’t have any data on this but health improvement may be the number one driver in the African American community, the number one thing they’re excited about biking and walking. Then, once they’re reintegrating biking and walking into their lifestyles, they want to changing their communities so they can do it more safely, more often, more easily… But it’s not infrastructure first. It’s relationships first, understanding the culture and motivations first, and then infrastructure can be a solution. 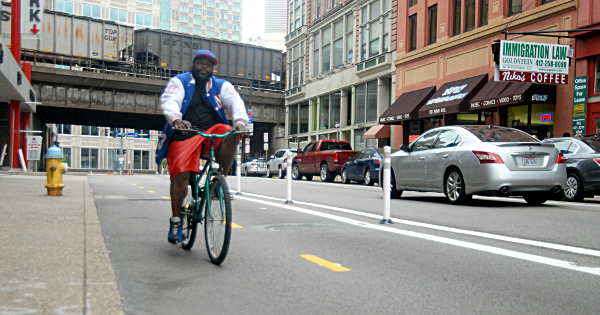 A protected bike lane in downtown Pittsburgh, 2014. The last thing that our group wants to do is advocate for bike lanes in these areas and then not have a way for people to thrive and stay in their communities and not benefit from the facilities we worked so hard to win. 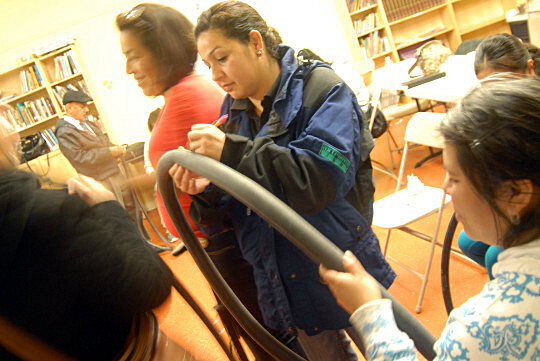 Veronica Rodriguez of Portland bike club Andando en Bicicletas en Cully marks tube leaks at a Community Cycling Center workshop in 2014. The general belief out there is, “If we just put more bike lanes in communities of color or make sure low-income folks have a voice at the table that’s the big key for this.” Honestly, I think that’s part of the equation that gets more communities of color or low income communities to bike more. But I know that realistic access to affordable bike ownership and repair will make a huge impact, too. A bike shop either for profit or non profit is a tool for the change everyone seeks. How do we make that happen? How can we make that happen as policy? Bottom line: if there is no bike shop in a neighborhood, it’s much more of a challenge for someone to start and continue to biking. At the PeopleForBikes Green Lane Project, we’ve chosen to focus our work on quality bike infrastructure because we think that’s where U.S. cities are underperforming the most. And the experience of the world shows that without protected bike lanes on major streets, biking won’t be safe, dignified and comfortable enough to make car ownership fully optional. But supporting great infrastructure isn’t the same as supporting only infrastructure. Among many other things, the League’s important new report is a reminder that infrastructure can’t be the only thing we think about as we work for better biking.